If you aren't already familiar with variables, make sure you read my earlier blog on creating and using variables before continuing. This VBA training blog shows how to create static arrays, dynamic arrays and even multi-dimensional arrays! A built-in structure for holding related information (otherwise known as a range of cells). The main reason to use arrays is to speed up processing. For the above example, if you're going to refer to the list of 6 people frequently it may be quicker to read their names into an array and hold them in memory. You can not put something in the 0th element of an array if it starts at 1! 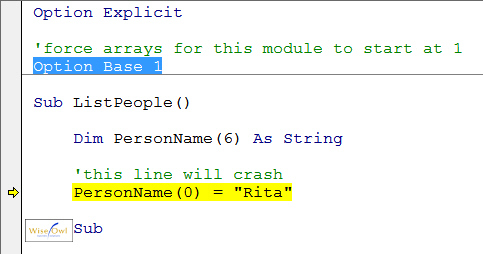 Simplicity If you start arrays at 0, you won't have to type Option Base 1 in every new module. Consistency VBA isn't consistent about arrays: some built-in arrays (such as the SelectedItem array returned from a file dialog box, for example) start at 1. However, on the whole most arrays start with 0. Compatibility VBA may allow you to start arrays at 1, but other languages don't. In particular, if you ever want to graduate from VBA to VB or C#, you should get used to arrays starting at 0. And with that out of the way, let's start looking at how to declare and use static arrays.